Posted Dec 07, 2018 by Eds. We should not speak ill of the dead. Even if the truth is unsavory, the dead deserve our condolences and respect. We must be civil. Especially if they are white. Last night, just before I dozed off, I caught the first few minutes of SportsCenter with Scott Van Pelt (who actually hosts the best version of the show since ESPN got rid of Jemele Hill and Michael Smith’s 6 p.m. version). Each night, Van Pelt opens the show with “SVP’s Best Thing,” which is the best thing he saw during that day. 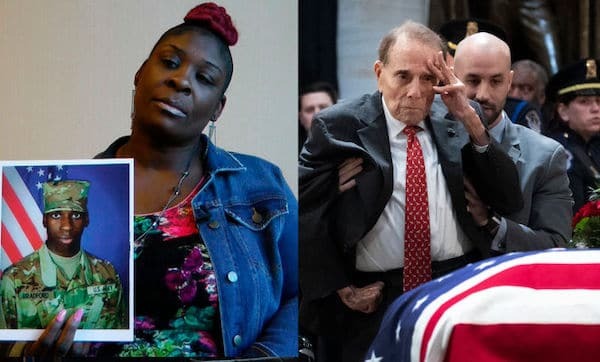 On Tuesday’s show, he replayed the moving clip of Bob Dole saluting the casket of former president George H.W. Bush. Dole had come to Washington to pay his respects for a National Day of Mourning. Van Pelt heralded Dole’s tribute and mentioned how it reminded him that civility, respect, and honor still matter. As Van Pelt opined about how this particular corpse highlighted the need for reverence and unity in America, protesters in Alabama were shutting down a busy interstate exit ramp in Hoover. Before stopping in the middle of the interstate, backing up traffic for miles as if they were part of a presidential motorcade, the protesters had already marched inside a local Wal Mart and a Buffalo Wild Wings for their own day of mourning. The protesters were demanding justice and transparency for the death of Emantic “E.J.” Bradford Jr., who was killed by a Hoover police officer on November 22. Since the incident, demonstrators vowed that the idyllic Birmingham suburb will not have peace until justice has been served. Matt, do you know if I was to go to the exact spot on I -459 as the racist mob did, and stick my thumb out to hitchhike , hoover police would arrest me on public safety charges. So much for civility, honor and respect for the dead. Although many people are angry about the whitewashing of George H.W. Bush’s legacy, I did not find him particularly evil. Considering how Ronald Reagan has become a Republican hero in death and George W. Bush has been whitewashed into an affable Muppet who once ran this great land after stealing the presidency, I can’t say I am surprised that Bush Sr. is being remembered as a hero and a statesman. He fucked the whole AIDS thing up, but he didn’t demonize the disease as much as Reagan did. He ramped up the War on Drugs, but not as much as Clinton did. In fact, my favorite memory of George Bush is when he ordered a drug buy outside the White House and sent a black teenager to prison so he could pull out a bag of crack from his presidential desk on national TV. When Trump lies, they will say, for civility’s sake, that it is “inaccurate.” When he insults majority-black countries, they will call it “demeaning.” They will print the word “shithole” before they dishonor the presidency by calling him a racist or a liar. Few have mentioned how George Bush went on TV and demonized public housing projects as crack dens, even though 74 percent of the drug violence were caused by drug laws, not drugs. Crack was no different than cocaine. The “crack babies” epidemic was a myth. Most crack users were white. But we are supposed to honor and respect a liar because… civility. Yet, when it comes to dead black bodies, there are no calls for reverence and dignity. Hours after he was killed by Darren Wilson, they stripped Michael Brown of his decency by painting him as a strong-arm robber. News outlets ran the worst photos of Trayvon Martin they could find while showing George Zimmerman’s bruised face. Korryn Gaines was painted as a suicidal maniac. And in Hoover, less than an hour after he was killed, police told the national media that E. J. Bradford was a violent criminal who opened fire in a crowded mall. They did not give a damn about an investigation when they assassinated his character and desecrated his memory. But the protesters are supposed to wait for the investigation. They should remain civil. They should honor the legal process. The reason the protesters have chosen to disrupt the lives of regular Hooverites is because of the “legal process.” The legal process allows police to disproportionately kill black people without fear of punishment. The legal process does not serve black people. It protects the residents of Hoover while snuffing out black lives like the end of the meaningless candlelight vigils they would have us attend instead. But we remained civilly disobedient. Furthermore, I am willing to bet my life savings that somewhere, right now, there is a black mother or father wondering if their child will make it home safely. After the evening of November 22, April Pipkins and Emantic Bradford Jr. no longer had to wonder.